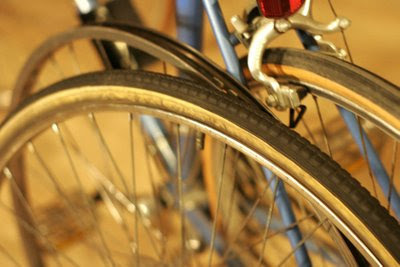 One of the single most important things on a bike are its tubes and tires. 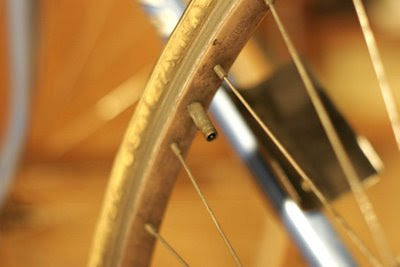 I've been taught how to do all of this at a young age and am so used to doing it by myself that when I hear about people taking their bikes to the shop to get the tires changed, I'm shocked. What else is the time and money wasted when you could just do it yourself! I understand that some people are not handy with tools or their hands.. but honestly! a 6 year old could do it! 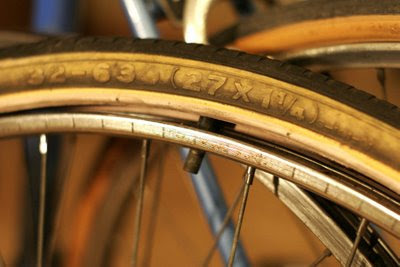 Say the tires on your whip are old or the tube went flat on you and you need to change it out. This is how you do it. Take a wheel and tire. Here's one. Find the valve stem. Sometimes it has a cap over it. 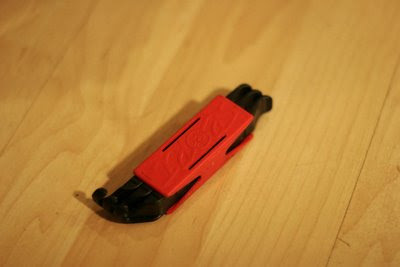 If there is, unscrew the cap to expose the stem. 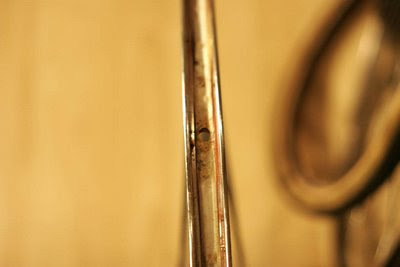 Now there's a valve needle sticking out right in the middle of the stem. Take your pinky and press it into the stem. This will let out the air and deflate the tire. 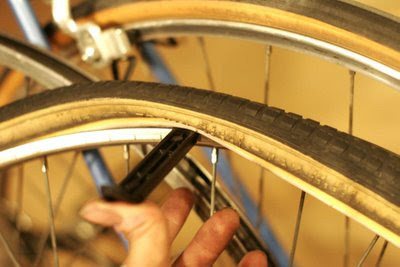 Squeeze the tire to get as much air out as you can. Now the tire is loosely fitted over the rim. 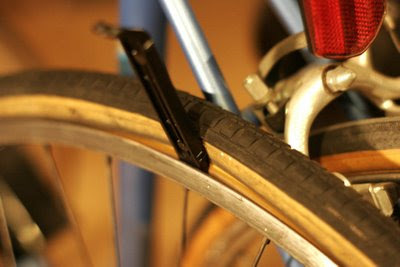 Take one of the prying bars and stick it into the tire. 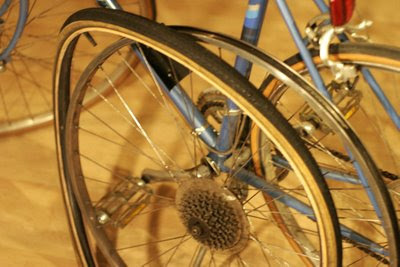 make sure the curvy head is facing out so that it hooks the bead of the tire. Pry it out and it should look like this. Now get another prying bar and get it in there. 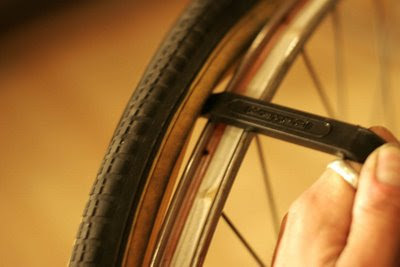 Now what you do is hold one still, or you can use the hook end and hook it to the spoke as pictured. 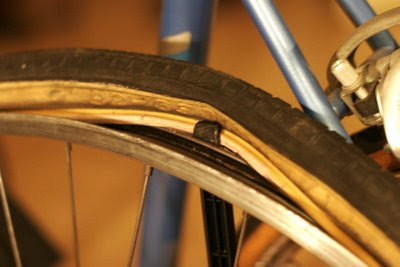 With the other bar slide it down the track to push the tire out of the rim as shown. That took at lot of hustle. Go all the way around and the tire will be half off. At this point some tires will just come off if you tug it. Some are on there rather tight though. What you do is go from the other side and pry it out just as you did before. 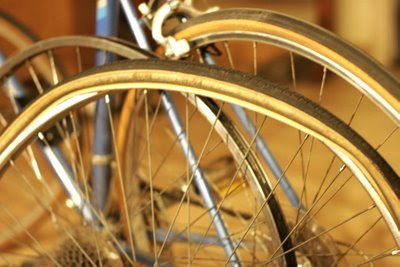 Before installing the tube and tires there's a little deal that you have to take care of first. Bicycle rims have spokes and on the inside of the rims these spokes are exposed, or at least the holes leading to them are. They may seem harmless but at 80 foot pounds of pressure per square inch, a tube can and will severely destroy it self on these holes. What you do is cover them up. 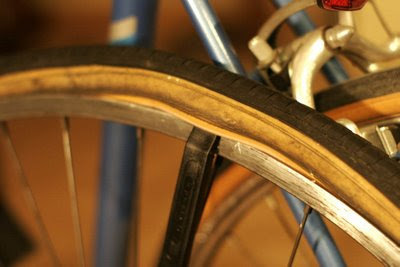 Bike shops have what's called rim tape. You can use those, they're pretty self explanatory. If you don't want to use rim tape and have an old tube lying around (how bout that one that went flat on you) you can cut it up into a strip and use it just like rim tape. 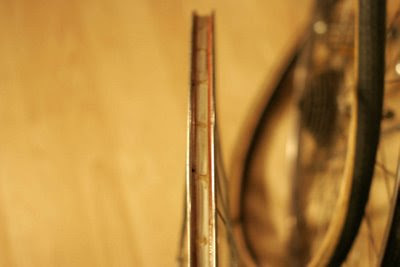 Make sure the fit is snug (just cut it a little shorter than the circumference of the rim so that it stretches and fits firmly and covering everything like shown below. 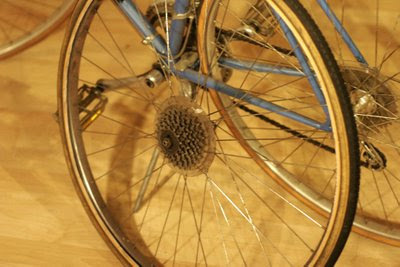 Don't forget to make a hole for the stem to go through. 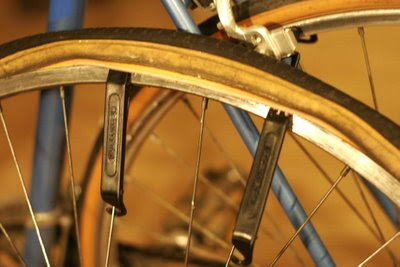 Now the easiest way is to put your new tube into your new tire and take them as one unit. Put the stem where it belongs through the stem hole in the rim. On some rims, the one side will pop in easily, if it doesn't, pry it in. once one side is all in, start putting the other side in. start where the stem is because you will need to pry the last inches in later and it wont be good to pry where the stem is. 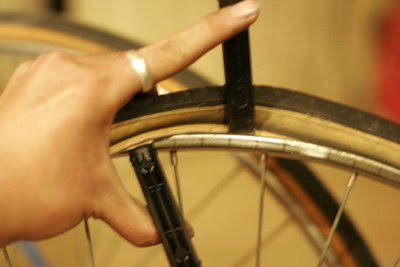 Most of the tire should pop in by hand until you reach something like this where it'll get too tight to do with your hands. You're gonna need two hands and two prying forks for this. Put one at each end and fork it in, careful not to get the tube as this will damage it. Once you get them both in. Pry upwards and this should push the tire up and into the rim. 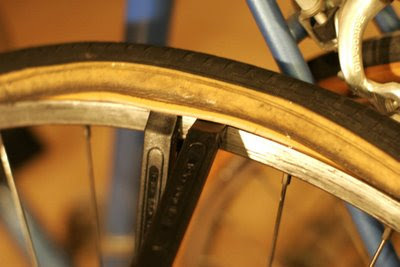 (EDIT) A friend of mine who is a professional bike tech reminded me that you shouldn't be needing the tire levers to install the tires back onto the rims. If you keep the tube centered in the tire as you go, you should only need the force of your thumb and palm to get the tire on. 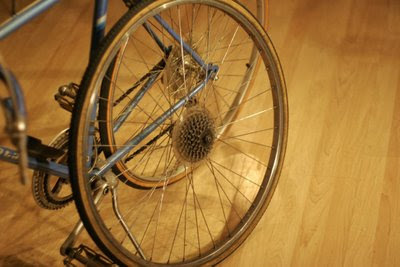 This is better for the tire and you wont be running a risk of puncturing the tubes. There are occasions where the fitment needs a little lever persuasion though. Do one side, then the other. moving closer together after each pry. After the last one, the tire should just pop in and you're good to go! don't be afraid to use a little force on this, it might feel like you're going to break the prying bars but you probably wont. Fill the tire up with air slowly, checking for trouble spots. You are now good to go! As a note. Some wheel and tire combos have a lot of lax in their fitment, this makes it easy to install but when filling it with air pay close attention to make sure all of the tire bead is grabbed by the rim, sometimes it comes out and the tube pops if you don't notice it. For the tire and rims with a tight fit you might want to use the handle end of a metal spoon to do your prying because I've broken the plastic pryers before.